Welcome to eZee Insider, in this special edition, we look back at the year acknowledging the growth of eZee around the globe. Special message from CEO - Mr. Hitesh Patel, CTO - Mr. Vipul Kapoor and also eZee Malaysia Team looking back at achievements of eZee. Since 2005, our goal at eZee has been focused and consistent: to create innovative solutions for the hospitality industry which makes processes simple. Year after year, we have followed a disciplined approach: building exceptional products, seeking out new opportunities for growth and wisely reinvesting our capital back into the eZee brand. Today, eZee is a complete hospitality service provider and continues to grow at an exponential rate. 2013 was a significant year for eZee on many fronts; we have taken significant steps forward in strengthening the eZee brand in India by opening a branch office in the capital of the country, New Delhi. Today I am proud to say that we serve clients in more than 130 countries around the world. Suffice to say that none of it would have not been possible if it wasn't for everyone here at eZee and other eZee members around the world, my words cannot express my gratitude but thanks to each and every one of you. At eZee we are very appreciative of the loyalty and support of our growing client base, which is the sole driving force for our growth. I would like to thank all of our business partners and for the opportunity of being able to both provide service and to further develop our relationships. In closing, I would like to wish everyone a Happy New Year and well deserved break. Thank you once again for invaluable support in 2013, and look forward to closer cooperation and success in the years ahead. At eZee, our focus is always to make solutions, which makes tasks easy, simple, and efficient. Building reliable customer centric solution is the key to our success. eZee currently offers a complete range of solutions for the hospitality industry, being one of the only few in the industry to do so. Utilizing industry's best practices and using the latest technologies, all eZee products are built to be stable and powerful. We have greatly diversified our product offering during the year in form of eZee iMenu – Restaurant Tablet Menu, eZee iFeedback – Online Feedback System and eZee Appytect – Hotel App Builder and in the first quarter of next year we plan to launch another product eZee iLoyalty – Online Loyalty Software which will further strengthen our offerings for the future. Working towards a software ecosystem is something we strongly work towards, each of the eZee products is compatible with each other creating a shared ecosystem where all the business operations run smoothly. Furthermore, the each product itself can be implemented within a business ecosystem with complete interface support for third party hardware and software. 2013 has been a good year for eZee in product development and innovation and we hope to continue the same in the coming year. We believe our true potential is yet to be unlocked and many more goals are to attain, we look forward to the continued support of our employees and customers. On one final note, without taking further of your time I would like to wish everyone at eZee, our partners, and our clients around the globe happy new year and hope that new year brings success to each and every one of you. As we head into the holiday season and welcome 2014 I wanted to take this opportunity to wish everyone happy holidays and thank you for the amazing support this year. It has been eventful year for us here at Kuala Lumpur Office but it is 2014 which truly brings excitement for us. In 2014, Malaysia will celebrate its fourth Visit Malaysia Year with the theme "Celebrating Malaysia Truly Asia". VMY 2014 will be the biggest and grandest ever tourism celebration with hundreds of events and festivals which will attract record number of visitors from around the world. eZee looks forward to supporting the local tourism community and strengthening our relationships with our clients in the coming year. Another milestone which we are really proud of is that we have a eZee product in each and every state of Malaysia. When 2013 started we had decided to start strengthening our relationships with our resellers in the region. We took many successful initiatives for our partners such as holding product workshops and training sessions. We even took our first step into Hospitality Consultancy by taking over management duties of our clients and turning it into a success story. We are proud of the success we have achieved in last 2 years. Our Corporate office, which is headquartered in City of Surat, Gujarat, India has provided with unconditional support and strength to achieve our goals in the region. In addition, I would like to take this opportunity and thank everyone at Surat Head office, the support team, developer teams and the design team and wish them the best for the coming year. Without taking further much more of your time, Happy New Year to each and every one of you who is reading this. With an ever-increasing number of clients around the globe, it is imperative that the support department provide prompt and round-the-clock service. Over the years, eZee have gathered extensive expertise in developing processes that enable us to provide our clients with undisrupted support via Live Chat, Email, Phone, and Onsite Support. One of the most important aspects of support is to provide our clients with unique combination of mediums through which they get access to all of eZee's support services. 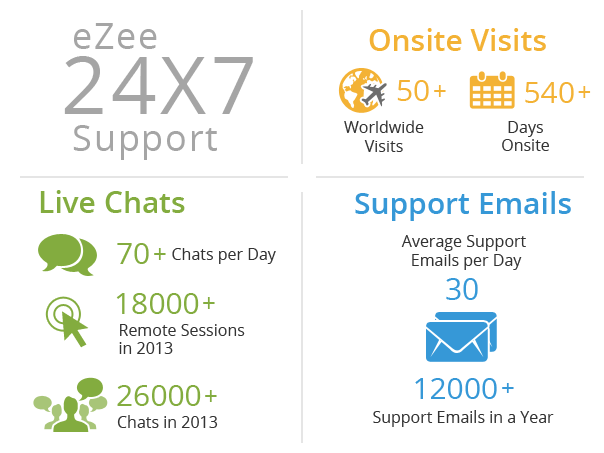 Here few of the highlights of eZee 24X7 Support for year. Live Chats - One of the most convenient way of getting in touch with eZee Support is the Live Chat, which was the most common method used by our clients worldwide. Approximately 26,000 live chats were taken during the year giving per day average of 74 chats. In addition, more than 18,000 successful remote sessions were conducted troubleshooting, demo, implementation and training bringing per day average of 50 per day. On-site Support - eZee's On-site support program allows us to help our clients with more personalized support whether it is a new client who needs a helping hand in implementation, or an existing customer who needs more in-depth training or upgrade. The service in 2013 yielded more than 50 on-site visits around the world with more than 530 plus days of eZee support expert on site. Support Emails - eZee's Support Email service was another way which our clients benefited greatly from, with more than 12,000 support emails received in the year and were answered within 24 hours at average of 33 emails per day. eZee Support is committed in providing the same level of service for the coming year. eZee Support would like to take this opportunity by wishing everyone happy holidays and best wishes for the coming new year.